Late February means another Mobile World Congress, and the rush to make big, splashy product announcements before the show starts. Samsung jumped in early today, by announcing an 8-inch tablet with stylus -- Galaxy Note 8.0. The slate is about the same size as Apple's iPad, with comparable screen resolution, but features the S Pen and supporting software. Why just touch and type when you can draw, too? 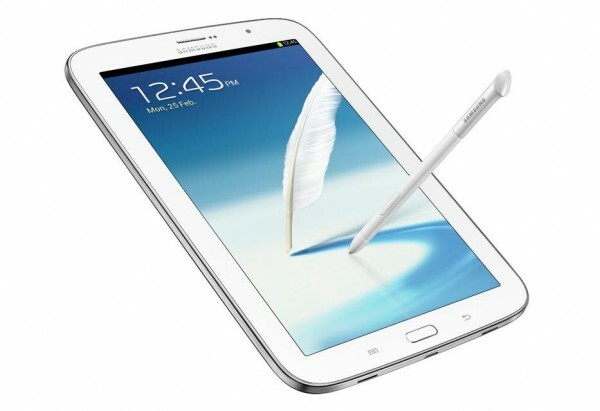 Samsung's slate joins the Galaxy Note II smartphone and 10-inch tablet, with stylus being the compelling feature that market leader Apple doesn't offer on any iOS device. Like the recent update for its siblings, Galaxy Note 8.0 comes with a split-screen, multi-window function. The tablet runs Android 4.1.2 customized with TouchWiz UI. 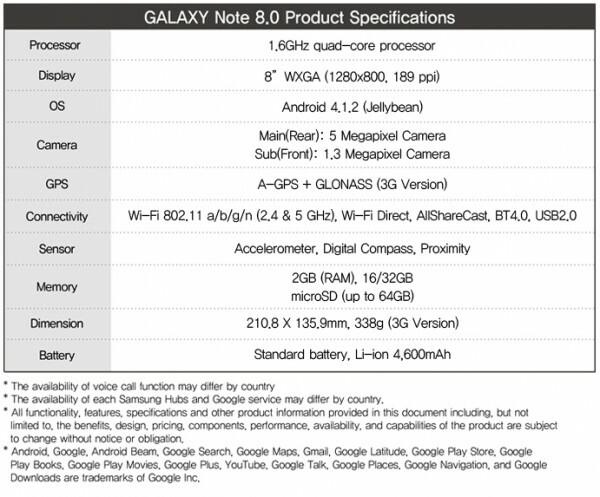 Galaxy Note 8.0 is slightly larger than iPad mini -- 210.8 X 135.9mm, 338g vs 200 x 134.7mm, 312g, respectviely. Apple's tablet has 7.9 inch display, with 1024 x 768 resolution and 163 pixels per inch, compared to the Note 8.0's 1280 x 800 and 189 ppi. Samsung plans to start selling the new Note in second quarter. "Back in 2010 the launch of the first Samsung Galaxy Tab with 7 inch screen opened a new chapter in the mobile industry", JK Shin, president IT & Mobile Communications Division, asserts. "The Galaxy Note 8.0 breaths fresh life into the category as it delivers the perfect fusion of portability and everyday productivity -- the result is a pioneering, pocket-sized solution that enhances and enriches our everyday lives, whether at work or play". Apple and Samsung are the industry leaders in the tablet market. During fourth quarter, iPad shipment share fell to 43.6 percent from 51.7 percent annually and from 46.4 percent sequentially. Samsung's share rose to 15.1 percent from 7.3 percent year over year. Samsung has a long way to go to catch Apple, but the market is changing. During third quarter, Android tablet share pushed past 50 percent, snatching iPad's early lead, according to IDC. "I think the big picture is that for many years people insisted that there wasn't a tablet market, just an iPad market", Tom Mainelli, IDC research director for tablets, says. "The last few quarter have shown that there is indeed a market for tablets beyond the iPad, although that product continues to be quite dominant from a vendor market share perspective". Samsung's renewed push into smaller slates is timely. According to NPD DisplaySearch, market demand shifts towards smaller, and lower-cost models. The firm forecasts that slates with 7-7.9-inch displays will account for 45 percent of shipments this year. By contrast, 9.7-inchers will fall to 17 percent -- that's the size of iPad. Apple introduced iPad mini in late October, in response to changing market conditions and consumer demand for small sizes.